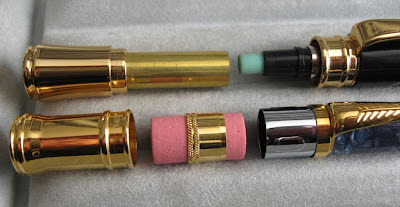 I know a few of you out there are quite keen on customizing and modifying your mechanical pencils. Here’s a little inspiration for you, just in case you haven’t already seen it. Over in Japan, Isu of the The Uncomfortable Chair blog likes a bit of modifying too. He recently sent me one of his modified pencils, the Pentel Graph 600 2.0mm. It started out in life as a Pentel Graph 600 0.5mm, but surgeon Isu transplanted some innards from (I think) a Stilus Secolgraf 151 Totmina 2mm leadholder to make the Graph 600 2.0mm. Those big clutch jaws look kind of freaky. For full instructions see the four instalments on Isu’s blog. “Made in Germany” and “Made in Japan” say an awful lot and both those sets of three little words can be an extremely valuable sales tool. They imply the highest standards of design, manufacture and quality, and provide immediate differentiation from similar items that do not bear either of those wordings. This doesn’t mean that other countries don’t also make exceptional products, it’s just that German and Japanese manufactured goods are generally pre-eminent. Unlike “Made in Japan”, “Made in China” leaves me in a quandary. Many Chinese companies produce goods of high calibre, others produce goods that offer outstanding value for money, but unfortunately many produce complete and utter junk. 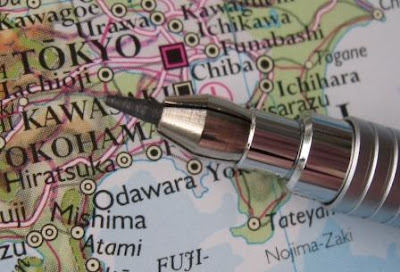 As with most industries, over the years more and more writing instrument manufacturers have been shifting their production base from their traditional locations to China. For example you will find “China” on a proportion of Pentels. 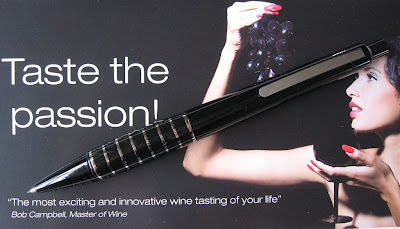 After 11 years of development, Beifa Co., Ltd. has become the third largest pen manufacturer in the world, and the largest pen manufacturer in China. 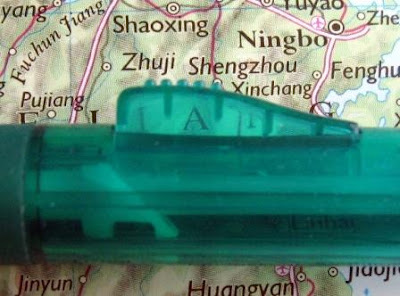 With an annual manufacturing capacity of 2 billion pens and annual sales of 1 billion RMB (£71 million), of which 100-million-dollar (£57 million) sales from exportation, Beifa’s manufacturing capacity is in the top 3 in the world, and its annual sales in the top 10. Beifa’s products are sold in more than 150 countries worldwide. Many big retailers and wholesalers such as Staples, Office Depot, Wal-Mart, National Pen, Myron and Metro, have been Beifa’s customer for many years and kept a longtime business relationship. The company is named as State Level High-Tech Enterprise, received more than 750 patents and inventions worldwide, and certified as ISO9002 Quality System and ISO9000 Company by DNV. 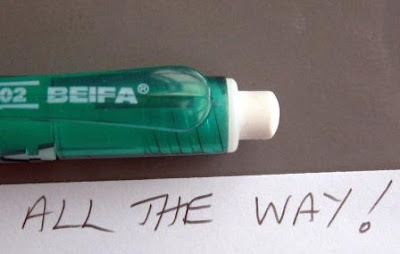 No doubt much of their export sales are under customer and house brands, but earlier this year I was in a Dollar Shop and saw a Beifa brand mechanical pencil. I thought that considering the price I should check it out - after all, they are one of the largest manufacturers in the world so surely it couldn’t be complete rubbish? So, without further ado, I present the Beifa MC1002 Mechanical Pencil. First impressions then. Well, this is a wide bodied lightweight plastic pencil. I’m not a great fan of fat side-clicker type mechanical pencils so this isn’t really to my personal taste. Having said that, a closer inspection is generally favourable. The transparent plastic body seems to be a high quality moulding. Good hard glossy surface, no scratches, flow lines or other visible flaws. The mechanism is a side-button activated ratchet advance, ten clicks will get you about 6mm of the 0.5mm lead. The button is quite stiff to push and the mechanism gives a very loud positive sounding click as the lead advances. 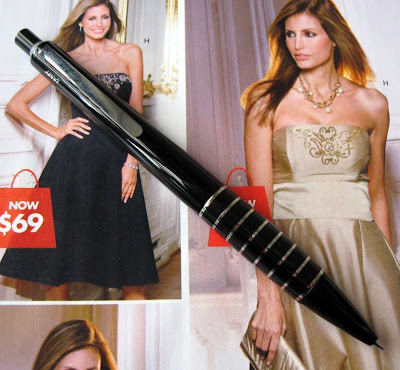 The lead sleeve is a short retractable metal cone so the pencil is pocket safe. The rubber grip is somewhat unusual in shape, having those two lower ridges and then a plain smooth area. I didn’t really like the feel of those ridges under my fingers. 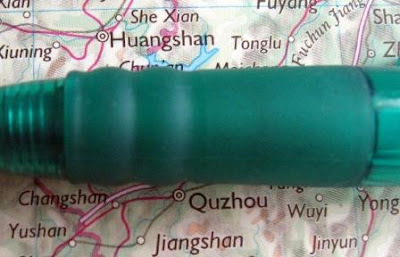 The rubber grip is a medium hardness compound with a little give in it. It’s not particularly grippy so it’s all rather debatable whether it actually improves your grip or not. The pocket clip is quite good and strong for an integrally moulded plastic clip. The only marking I can find on this mechanical pencil is the printing on the pocket clip - the rather uninspiring insipid looking model number and Beifa name. The moulding part-line runs down the middle of the pocket-clip and as you can see that interferes with the printing. It’s hard to imagine any of the more well known brands considering that print quality acceptable. The pocket clip is part of the twist-out eraser section. The whole section seems well secured to the main body so I don’t think it’s likely to come off inadvertently. You pull the whole section off to access the lead refill chamber. So far this mechanical pencil has been doing quite well but the twist-out eraser system is a real let down. Firstly, it only twists out about a 7mm length of 6mm diameter eraser. That’s such a short length, why bother? If you are going to the expense of a twist out cartridge surely you want to accommodate a decent length of eraser? Next the eraser extension is not very secure. By that I mean it pushes back in under reasonable pressure, so whilst erasing the screw threads might just suddenly disengage and the eraser will fully retract. Third and last, the eraser compound itself is a very mixed bag. At first it was utterly and completely useless. It didn’t erase at all, and when I say 'at all', I mean 'at all'. It was hard and scratchy, and it just smeared graphite all over the place. I couldn’t see anything obviously wrong, but wondered if perhaps there was some sort of hardened outer-layer causing this problem so I deliberately pressed and rubbed really hard to try and break though and remove any such layer. This did indeed improve things, so there clearly was some sort of outer surface layer problem, and once that outer surface was removed things improved dramatically. The eraser went from utterly useless to…not particularly good. The smearing stopped, but it still didn’t erase anywhere near as well as Staedtler Mars Plastic and similar benchmark products. In summation then, as an economy price range item, this Beifa MC1002 mechanical pencil is reasonably good, except for the eraser system, which quite frankly really lets the side down and cancels out the good points scored by the rest of the pencil. It is the sort of poor design and quality that keeps “Made in China” from having any marketing value. Best Points – Mechanism and body moulding seem surprisingly good. Not So Good Points – Everything to do with the eraser. Dimensions – Length 140mm, diameter 12mm. Balance point about 75mm up from the tip. 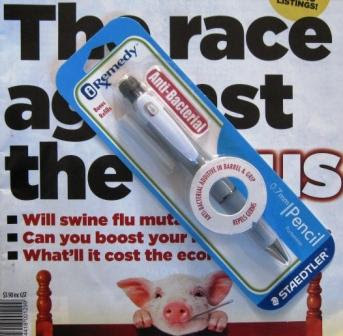 I don’t normally include the leads supplied with a mechanical pencil as part of the review process. 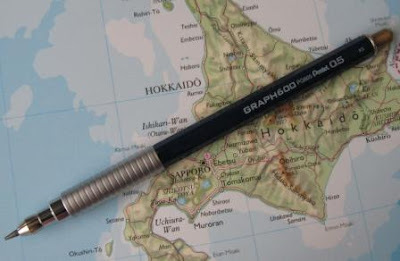 Being able to swap the leads to your favourite brand and hardness is an inherent aspect of mechanical pencil use, but of course the leads supplied with a pencil do reflect back on the pencil brand. One would not expect poor quality leads in a well known brand mechanical pencil, but I personally do generally expect poor quality leads in economy grade pencils from the Dollar Store and its ilk. So, it is with some surprise that I feel I must report that the leads supplied in this Beifa mechanical pencil weren’t actually that bad. 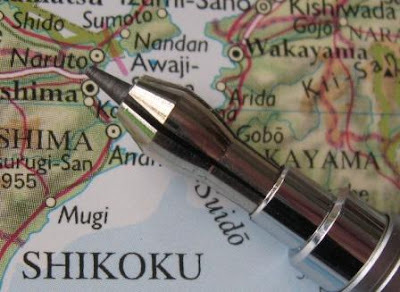 Certainly the folk at Pentel or Mitsubishi Pencil wouldn’t be losing any sleep over these leads as possible competitors, but compared to my previous experiences with Chinese leads they were a pleasant surprise. In a nutshell, they were actually usable – reasonably dark, reasonably strong, a little on the scratchy side, but overall they were…reasonable. What more can you expect for peanuts at the Dollar Store? As I said back towards the beginning, I purchased my mechanical pencil as a blister-packed combo with a container of lead refills. They are labelled as ‘ACH’ brand, 0.5mm HB, 60mm x 15pieces, item code WL685A. I assume Ach is a brand of or associated with Beifa. Here’s another thing I can’t fathom – the graphic design of the container is terrible. That silver metallized surface seems to have edge areas that are deliberately darker and less shiny so the whole thing just looks used, second-hand and worn. The Ach and other lettering is in a dull lemon yellow colour which just doesn’t stand out at all on the metallic background. Perhaps this sort of graphic design and colour scheme looks different to people of an Eastern cultural background, but I honestly can’t imagine any western schoolchild getting a passing grade in their beginner graphic arts class if they came up with this lot. 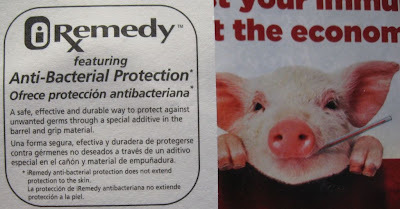 Nasty swine-related germy-things are big news these days. I don’t mean to make light of the situation or the very real nature of the threat, because I personally take it seriously, but it’s a good time to be in the respiratory mask business and/or the hand and surface sanitizing product business. 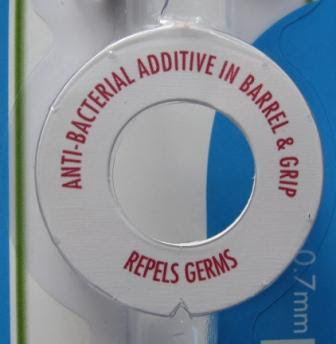 I imagine that sales of everyday items impregnated with anti-bacterial compounds are also on the up, although the efficacy of many of these anti-bacterial agents in combating a virus like influenza is another question entirely. Rest easy knowing that this is one pencil that won’t catch some nasty disease. Here’s one blokes opinion on anti-bacterial products, not that I’m agreeing or disagreeing with his views. It’s Lamy time again. I’ve had this Lamy Accent for a few years now. 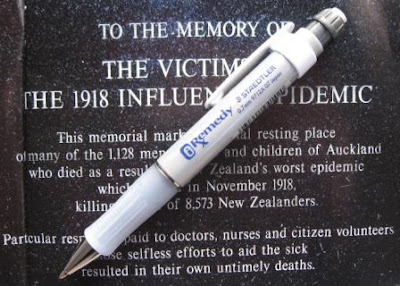 To be precise it is a Model 198 LD 0.5mm Lamy Accent Brilliant Mechanical Pencil. There are both Lamy Accents and Lamy Accent Brilliants, the ‘brilliant’ bit denoting the body is ‘brilliant black lacquer’ finish as opposed to the matt black or palladium finish bodies. Brilliant is a suitable adjective for this Accent as it is a high gloss black – a very shiny and classy looking mechanical pencil. 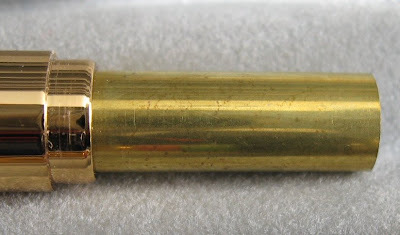 The LD bit of Model 198 LD means the grip section is “diamond lacquer”, which is also frequently referred to as “rhodium rings”. 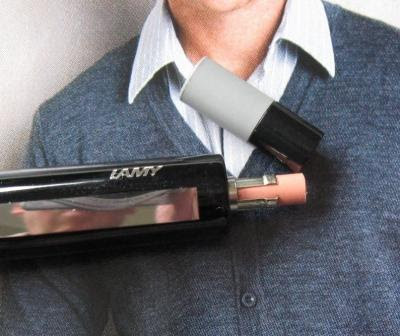 A feature of the Lamy Accent range of writing instruments is their interchangeable grips. Other grips currently available include Briar wood (BY), aluminium-palladium (AP), India rubber (KK) and anodised blue aluminium (AB). 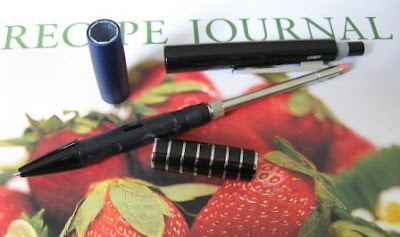 Lamy advertise the grips as interchangeable, but on their website the “accessories” list only includes refills and erasers, so buying another grip might be a little easier said than done. Certainly that was the case for me, but I did manage to obtain an anodised blue aluminium grip as a spare when I purchased my pencil. Weighing in at about 35g, the Accent is not a lightweight. Combine this with a fairly wide body, the glossy black colour scheme and shiny metal trims and you have a very impressive pencil in your hand. It looks solid; it feels solid; this is a mechanical pencil of substance. 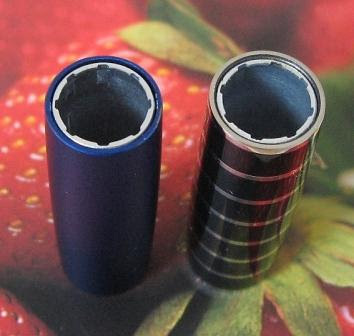 The lead sleeve is a small conical metal tip, not retractable. This pencil is for general writing only, and is not meant to be treated so callously as to be put in a trouser pocket. Clearly the designers intended you to use the pocket clip on the breast pocket of your jacket, or a pen loop or carry pouch. The pocket clip is solid metal, very shiny…clean, simple, and effective. It is spring loaded. There is a small amount of side to side play in the clip. I really like the look of the rhodium rings grip. The brilliant shine of the silvery metal and the black body look good together. The rhodium rings are not quite a perfect match to their adjacent black resin rings and you can feel a little texture beneath your fingers. I did worry that the super shiny grip zone would not provide a particularly stable grip, but it did better than I expected. Certainly it’s not the most secure grip in the world, but it’s acceptable. At about 12mm diameter the grip zone is wider than average and that helps – shiny and thin would probably be a disaster. One other comment is that for me the grip zone is just a little too high up on the body. I wanted to hold the pencil right down towards the lower end of the grip, almost off the grip and onto the taper of the tip section. As mentioned above, the grips are interchangeable, and I bought an anodised blue aluminium one as a spare. That was a mistake. The blue grip just doesn’t go with the black body. Too dull. To change the grips you unscrew the body and simply swap them over. 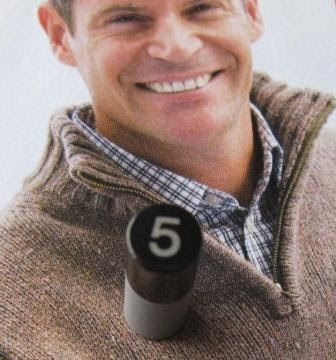 Up at the top end of the pencil is the push top button, which is boldly marked with a number to indicate the lead size. Ten clicks will get you about 7mm of lead. The mechanism is quite firm and fairly noisy. You definitely feel like you are pushing on some substantial spring loaded mechanism. Beneath the button is a small eraser…emergency use only. There is also a clean-out rod should you suffer a lead jam, and naturally the eraser caps off the lead magazine. Every time I look at this top button I just think that something’s not right. It’s that grey ring at the base of the button…I just keep thinking, “Has it popped out or something? 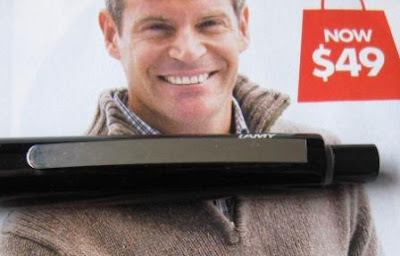 Ummmm...am I really supposed to be seeing that?” I searched around for pictures of the Lamy accent on retail websites. The grey ring is clearly visible on a lot of photos of Accents, but not so obvious on photos of Accent Brilliants, so I emailed Lamy about this grey ring - Was it supposed to be visible or somehow was my push top button sticking too far out of the body and the grey section wasn’t normally meant to be seen? Now a lot of companies have a “Contact Us” section on their website and then you never hear from them. Luckily Lamy are not one of those so I received this reply, “You are perfectly right, the push button is composed of two different materials. The reason is that this push button is removable and that the lower (grey) portion is rubbing on the inner side of the barrel when it is taken out or put in. 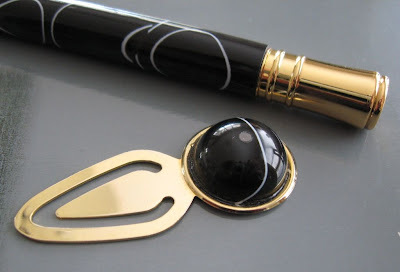 Choosing this material makes sure that the push button is not damaged or scratched in the process.” Well that’s fair enough, a scratched button can be an eyesore, but for me personally that grey ring really looks out of place on a brilliant black bodied mechanical pencil and I feel they could have done better. 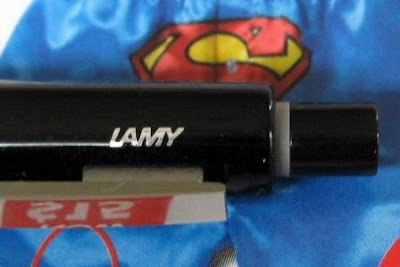 Quite a few Lamy writing instruments are not obviously marked with the Lamy name, but the Accent is. Up by the pocket clip we have ‘LAMY’ in small lettering, and if you look really hard you will see a well hidden ‘GERMANY’ in the recess on the underside of the pocket clip. Lamy pride themselves on their selection of materials and their design ethic. With the exception of that grey ring, I think they have done a good job with the Accent. They are also one of the few higher end brands who offer a mechanical pencil option as part of most model ranges, so irrespective of whether their pencils are to your taste or not, we should all give them a nod of appreciation for that. Best Points – It looks and feels impressive. Not So Good Points – That grey ring. It just looks like it’s sticking out and you aren’t really supposed to be seeing it. I’m not sure the grip zone is located in the ideal position. Does this pencil make it into the Top 5? – Now that’s a tough call. Lamy 2000 and Parafernalia Revolution are safe. That leaves Rotring 357, Rotring Newton Trio and Caran d’Ache Ecridor. It’s all a bit even, so I feel I must stay with the status quo, and thus Lamy Accent doesn’t make it into the Top 5, but it’s close. Dimensions – Length 141mm, diameter 12mm at widest point. Balance point about 65mm up from the tip. In German, ‘auch’ means ‘also’, ‘too’, or ‘as well’. I’m told that Pelikan made their first branded fountain pen back in 1929. Then in 1934 they introduced their first mechanical pencil. 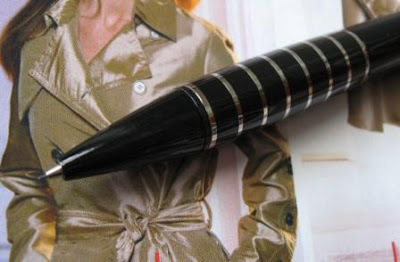 Like the fountain pen it was also a Pelikan, hence its model name ‘Auch’ Pelikan 200 – the ‘Also’ Pelikan, or the Pelikan ‘Too’, model 200 mechanical pencil. 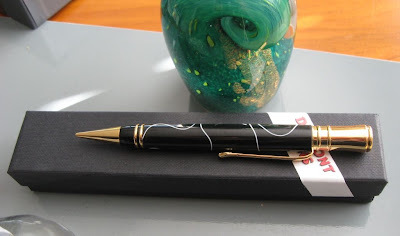 A while back one of my Scandinavian friends, a fellow who in the tradition of nicknames or ship-names I have named Manuka Pooh, went a-Viking and returned home with pocket loads of Pelikan plunder. Being a generous fellow he thought I might be interested in a Pelikan Too too and sent one down to me on the far side of the globe. 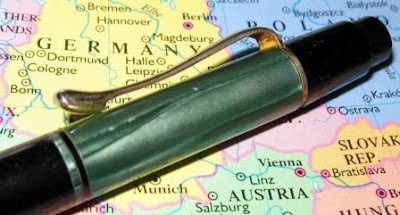 The web tells me that Pelikan made these green and black Auchs from 1937 to 1951 and this particular Auch supposedly dates from 1938 although I’ve no proof of that claim. It is in extremely good condition, virtually ‘as new’. There is no brassing or corrosion on the metal trims. The plastic body is in great condition. 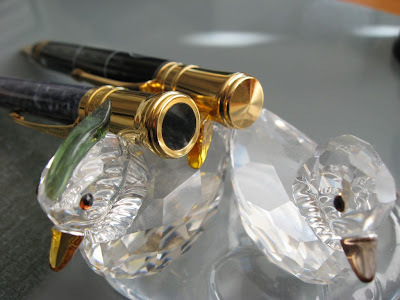 The wording ‘AUCH Pelikan D.R.P.’ is engraved into the top section of the pencil. Apparently D.R.P. stands for ‘Deutsche Republik Patent’. The push top mechanism is quite stiff and clicky compared to most modern mechanisms, but this could be from age rather than design. Back in the day, this was quite a modern and sophisticated mechanism – many (or most) pencils were still using screw type mechanisms back then. The lead is 1.18mm. It tends to chew leads a bit, perhaps modern leads are not quite to this old birds taste. With the recent purchase of my Parker Duofold Centennial, I now have two Duofold mechanical pencils. Both of them cost an awful lot of money. Over the past six to twelve months I have bought a few items from a pen turner and I became aware that many of the pen kits available are rather similar to the pen designs of some well known international brands. The Penn State Industries Executive pencil kit will look rather familiar to anyone who has a Duofold pencil. Having spent a small fortune on a Duofold, I decided that I would check out a PSI Executive mechanical pencil and see how it stacked up against a Duofold, so I contacted my friendly pen-turner and ordered one. 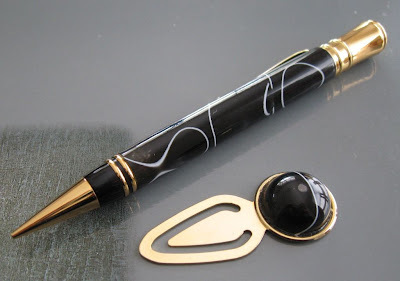 Firstly of course with a custom made item like the Executive you get to choose your pen body material from the hundreds and hundreds of wood and plastic pen blanks available. You also have several choices of finish for the metal trims. I decided to play it safe and chose the classic 24K gold trim with Lava Bright Classic 2 ‘black with white thread’ acrylic body. Secondly you must talk price with your pen turner. Now Duofold pencils are well into the stratospheric price range, and pen turners charge widely varying amounts, but in my part of the world an Executive is 10 – 20% of the price of a Duofold. 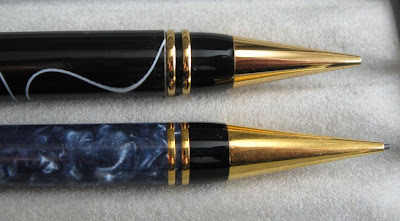 And along side the Parker Duofold Centennial pencil, lapis blue colour. You can't see it in the photos, but if you inspect the acrylic bodies closely you will see the Duofold is finished to a much finer level of polishing than my Executive was, but that will vary from turner to turner. Pencil tips. 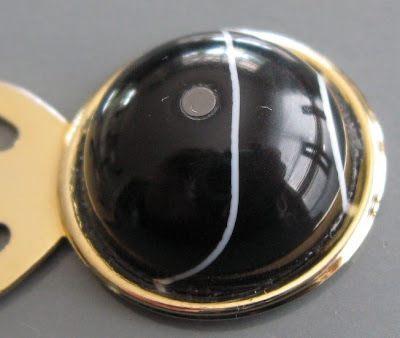 The Executive is actually a 0.7mm screw mechanism compared to the Duofold being 0.9mm. The refill procedure for the Executive is…well lets just say it’s on the complicated side of town. The Executive has some annoying play in its mechanism. The lead is free to move in or out a millimetre or so, thus when you first press the lead to the paper it will retract a fraction back up inside the tip. Now personally I find this rather annoying when I’m concentrating on it, but you don’t really notice it in general use. Certainly the folk in my office who have used my Executive or since bought one of their own don’t have any problem with the lead play. Pocket clips and end caps. Lets take a look under the hood. Beauty versus something a little more utilitarian Some residue left on the Executive. I don’t imagine Parker would leave that on a Duofold. Different tops on the end caps, with the Duofold having a black resin insert. Back in one of the first photos you will have noticed the little paperclip thingy. The pen turner tossed this paperclip in as a little surprise freebie ‘thank you’ with my pencil. The half-sphere end-piece is from material left over from my pencil body. Apparently with these clips he sometimes drills a hole in the centre of the end-piece and inserts a little something colourful - in my case instead of a semi-precious stone or some colourful glass, he felt a piece of 2mm pencil lead would be an appropriate jewel. 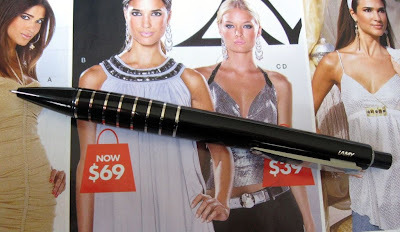 A Parker Duofold pencil is clearly outside of the price range that most people would consider paying for a writing instrument, but for 10-20% of that price a PSI Executive seems to offer a large percentage of the looks. Sure, pencil folk like me will start looking closely and find all sorts of things we think need improving, but the general public don’t give two-hoots about most of that stuff. From across the other side of the desk, a PSI Executive is a mighty fine looking object and most people would be very happy to own it, as am I.